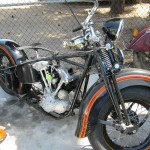 This is a 1953 PanShovel (Panhead lower end with a Shovelhead top end). It came to us from Pennsylvania needing to be rebuilt. 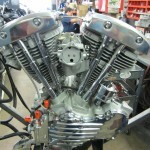 It is a 74″ engine. 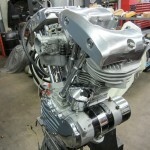 You might notice that we had to fabricate custom top end oil lines because of the unique nature of a PanShovel engine. 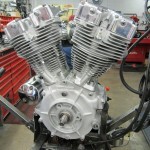 Part of the final rebuild process includes balancing and blueprinting the engine. Our customer wanted to take it back with him after his stay in Arizona for the winter. We were able to complete this project in about a month and a half. 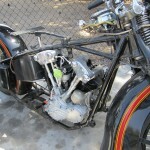 This is Chris V.’s 1947 Kuncklehead partial restoration. 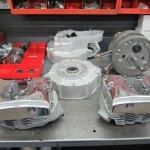 We are rebuilding the motor and transmission and installing it in his chassis. 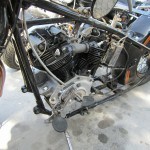 We are also installing new handlebars as well as replacing his aftermarket tanks with original ones. After all the changes are made the final step will be painting to match. 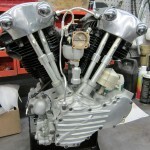 This is the first time the engine ran after restoration.